Today's recipe is an Italian chicken dish that I made a couple days ago. I've had chicken piccata at restaurants, but this was my first time making it here at home. It turned out DEE-lish. First off, ANY dish that uses fried chicken as a base can't be all that bad and combined with lemon, buttery flavors--it can't help but be a winner. -I actually didn't alter this recipe in any way. I will say though, if you're not a person who is big on lemon-y flavors--you may want to reduce the quantity of lemon juice by just a tad. -This is an Italian dish, so whenever I've been served this in a restaurants, it was always over pasta or another pasta dish was with it as a side. I wasn't wanting pasta this particular day, so I had it with oven-roasted broccoli and Parmesan mashed potatoes. Yummy! 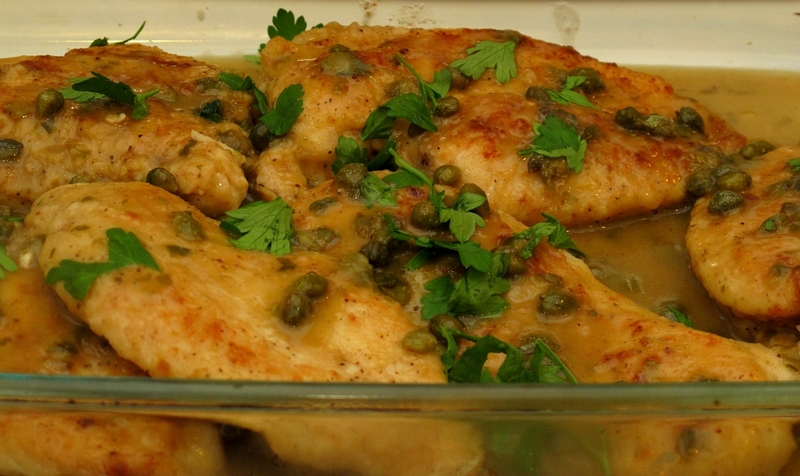 Your chicken piccata looks soooooo delicious. I'm glad I stumbled across your blog. I may try this for Sunday's dinner. Thanks for sharing the recipe. Yum! I love Chicken Piccata!! I want to make this tomorrow for Dinner! Thanks for the recipe! looks delish and i love capers! oooooo! that sounds delicious with the garlic mashed potatoes. the pasta always gets me too full. definitely gonna try this next week. thanks! that looks amazing! i am so making this! thanks for the recipe! I'm glad you all have enjoyed this dish! I never thought to try it with lime. Interesting.... I may have to experiment with it myself and see how I like it!